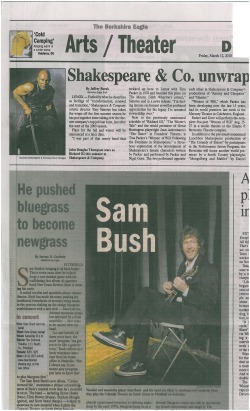 PITTSFIELD--Sam Bush is bringing it all back home. Thirty-seven years after he helped forge a new musical genre with the trailblazing first album of signature band New Grass Revival, Bush is showing his roots. A noted vocalist and mandolin player extraordinaire, Bush has made his name pushing the traditional boundaries of acoustic string music, in the process shaking up the stodgy bluegrass establishment with a new style—based on traditional mountain music, but informed by a fresh sensibility—that came to be named after his band. The Sam Bush Band’s new album, “Circles Around Me,” constitutes a plainer acknowledgment of Bush’s musical roots than he’s recorded in years. The band—including Byron House (bass), Chris Brown (drums), Stephen Mougin (guitar), and Scott Vestal (banjo)—is likely to showcase its new material when it plays the Colonial Theatre on North Street here on Saturday. Though the folk, rock and jazz worlds had already experienced boundary re-defining explosions by the early 1970’s, bluegrass hung on as a tradition-ruled genre and scene with a conservative bent. New Grass Revival shook things up on the traditional bluegrass circuit not only by incorporating electric instruments and songs by The Beatles and Bob Marley, but simply by eschewing the neat appearance and matching collared shirts still associated at the time with bluegrass. Bush cites the improvisations of the Allman Brothers Band, Grateful Dead and Cream as early influences, plus the work of John Coltrane—heard via a collection of recordings released by Atlantic Records artists. Bush recalls warming up at traditional bluegrass festivals and hearing audience members remark that what New Grass Revival played wasn’t bluegrass. “Yeah, we know!” was the band’s response. Though the occasional movie soundtrack has, from time to time, brought traditional American music to the forefront—be it the use of “Foggy Mountain Breakdown” in “Bonnie and Clyde,” “Dueling Banjos” in “Deliverance,” or any number of songs in “Oh Brother, Where Art Thou?”--Bush credits the rise of the festival scene with exposing his work, both with New Grass Revival and as a solo artist, to wider audiences. Though Bush’s signature style involves the incorporation of electric instruments and even a drummer—verboten in the land of traditional bluegrass—the latest album seems a celebration of the music that provides the bedrock for newgrass. It includes songs like “Midnight on the Stormy Deep,” associated with definitive versions performed by bluegrass godfather Bill Monroe, as well as two duets with legendary traditionalist Del McCoury. But it’s no historical re-creation. The album is fully informed by the evolution of newgrass. It even closes with a fresh version of “Whisper My Name,” a song dating back to the first New Grass Revival album. Though he rejected “Full Circle” as an album title due to the term’s over-use, Bush acknowledges it would have been a good fit.